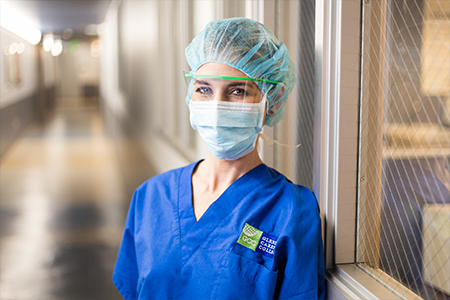 Become a vital part of the operating room team. 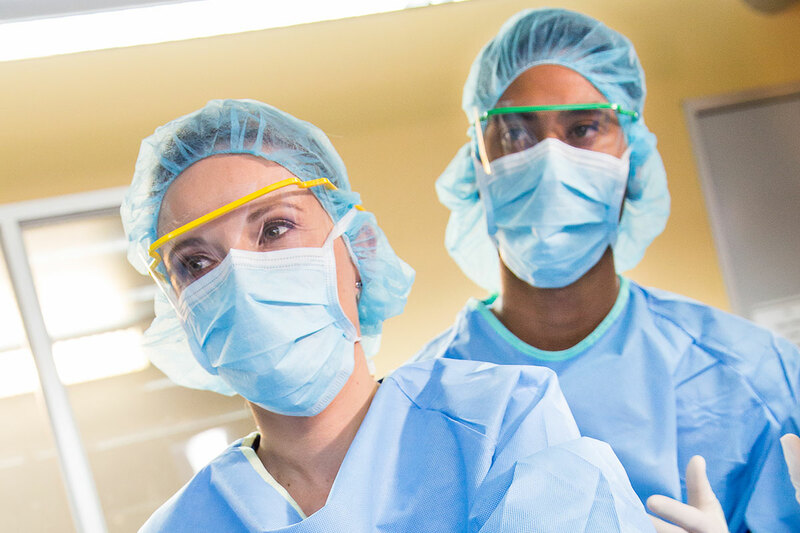 The Surgical Technologist program at Glendale Career College is a career-focused program that teaches technical skills and provides the hands-on training required to begin working with surgeons, anesthesiologists, certified registered nurse anesthetists, registered nurses, and other surgical personnel as a member of a surgical team. 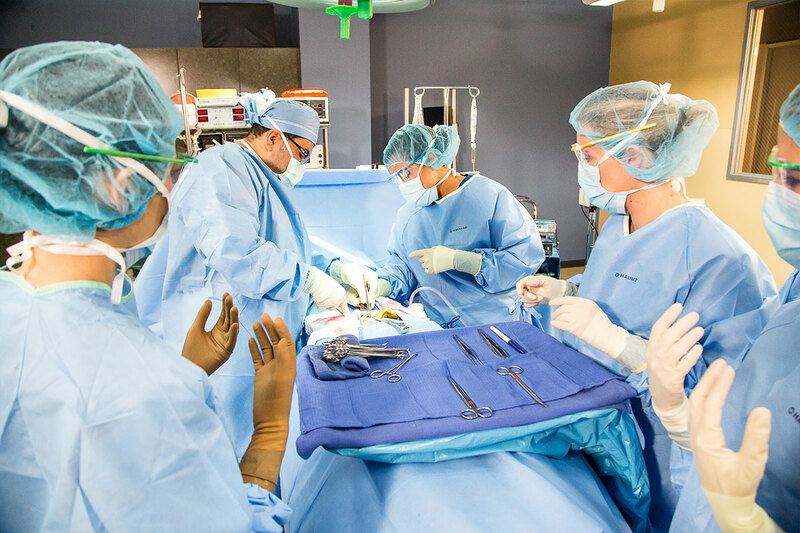 The Surgical Technologist program is designed to instruct in all phases of Surgical Technology, and to prepare competent, entry-level Surgical Technologists in the cognitive (knowledge), psychomotor (skills), and affective (behavior) learning domains. 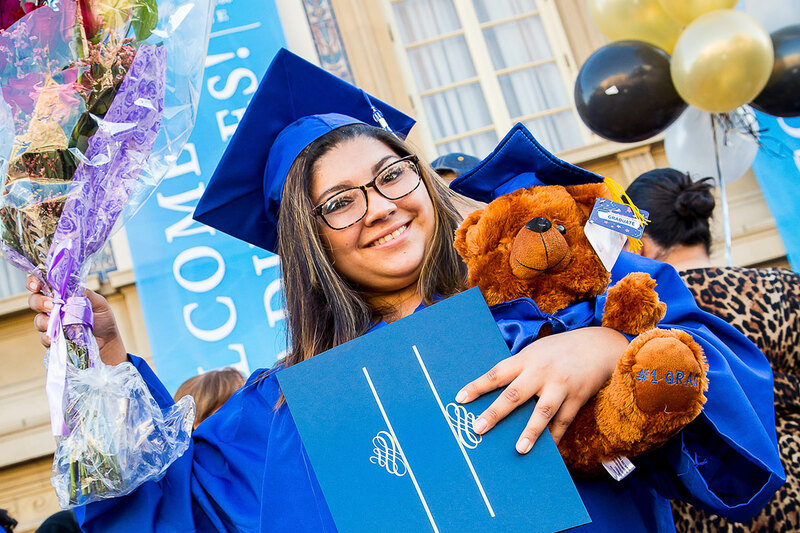 Upon completion, the graduate can effectively work with and under the supervision of surgeons or registered nurses and become an integral part of the team providing care to patients during the crucial periods of surgery. Much of the training is focused on the clinical aspect of the program where the students gain skills in helping to set up the operating room; prepare patients for surgery; scrub, gown and glove self and other team members; pass instruments and other sterile supplies to surgeons; help care for and dispose of specimens; and assist nurses in cleaning and stocking the operating room for the next operation. The curriculum reflects the latest developments in biomedical science.The program is divided into class course modules including three clinical externships where students will apply the skills they learn in the classroom in actual health care practice settings. Seminar for Success – This introductory course provides an overview of learning readiness skills, including how to study, student learning styles, reading skills to increase comprehension, time management and stress management, communication, teamwork, and leadership, an overview of basic health care-related math skills, and an introduction to medical terminology, including word parts and basic medical terms related to body systems. This course also introduces students to the field of surgical technology and the expectations of the surgical technology program. Outside preparation and study time, in addition to regular classroom activities, is required to complete the class assignments. The type of outside preparation may take the form of homework assignments, projects, reading, and required studying. The Human Body I – This course focuses on the structure, function, and disease processes of the human body, including the organizational structure of the human body, the Integumentary, Musculoskeletal, Neuro-Sensory, and Endocrine Systems, and medical terminology related to these systems. The course also includes an overview of the concepts and principles of microbiology as related to surgical practice, including microbe-based diseases and immunology. Outside preparation and study time, in addition to regular classroom activities, is required to complete the class assignments. The type of outside preparation may take the form of homework assignments, projects, reading, and required studying. Fundamentals – This course introduces the student to the broad field of Surgical Technology by addressing topics and concepts related to the health care setting. Included in this course is the job description of the Surgical Technologist, descriptions of the roles of care providers in the OR, including the role of the Surgical Technologist-Scrub Role (STSR), ethical, moral, and medico- legal practice, professional communication, teamwork, and employment skills. This course also presents concepts related to operating room practice and discusses the biopsychosocial needs of the surgical patient. The course also addresses the principles and techniques of disinfection, sterilization, and antisepsis as they apply to the Operating Room. The laboratory component of the course focuses on the skills related to the processing of surgical instrumentation and supplies in a non-patient utilization setting. Outside preparation and study time, in addition to regular classroom activities, is required to complete the class assignments. The type of outside preparation may take the form of homework assignments, projects, reading, and required studying. The Human Body II – This course focuses on the structure, function, and disease processes of the human body including the Circulatory, Cardiovascular, Lymphatic, Respiratory, Gastrointestinal, Genitourinary, and Male and Female Reproductive Systems, and medical terminology related to these systems. This course also includes an introduction to pharmacology, including medication types, sources, classifications, dosages, uses, and medications commonly used in surgery. Concepts of anesthesia, including methods, types, administration, and potential complications are also discussed. Outside preparation and study time, in addition to regular classroom activities, is required to complete the class assignments. The type of outside preparation may take the form of homework assignments, projects, reading, and required studying. Asepsis – This course introduces the knowledge, skills, and techniques utilized to prepare the patient for the surgical experience and to prepare and maintain the sterile field during the surgical experience. Included are pre-operative patient preparation, gowning and gloving, the establishment of the sterile field with the equipment, instruments, and supplies; patient positioning and skin preparation. pre-, intra-, and postoperative case management techniques. Outside preparation and study time, in addition to regular classroom activities, is required to complete the class assignments. The type of outside preparation may take the form of homework assignments, projects, reading, and required studying. Mock Lab – This course provides a laboratory environment in which students concentrate on development of skills and practical performances by preparing for a surgical procedures in a non-patient contact environment. Emphasis will be placed on learning and understanding the different responsibilities of the scrub and assistant circulator roles in the operating room and how to build teamwork by providing the student with the opportunity to assume sterile and non-sterile member roles, as well as an understanding of safety concepts, including instrument, sponge, and needle counts, as well as patient identification. During this course, students are given the opportunity to discuss, understand and demonstrate group dynamics, cultural diversity, leadership, and teamwork. Surgical Procedures I – This course focuses on integration of the professional knowledge of the Surgical Technologist using the procedural format. The anatomy, physiology, pathophysiology, case management, and patient considerations of General Surgery, Obstetrics and Gynecologic Surgery, Genitourinary Surgery, Otorhinolarygologic Surgery, and Oral/Maxillofacial Surgery will be presented. Outside preparation and study time, in addition to regular classroom activities, is required to complete the class assignments. The type of outside preparation may take the form of homework assignments, projects, reading, and required studying. Surgical Procedures Lab I – This course provides a laboratory environment in which students concentrate on further development of skills and practical performances by preparing for a variety of basic surgical procedures in a non-patient contact environment. Emphasis will be placed on learning and understanding the different roles in the operating room and how to build teamwork by providing mock situations in which students will have the opportunity to assume sterile and non-sterile member roles, as well as an understanding of safety concepts, including instrument, sponge, and needle counts, as well as patient identification. During this course, students are given the opportunity to discuss, understand and demonstrate group dynamics, cultural diversity, leadership, and teamwork. Surgical Procedures II – This course focuses on integration of the professional knowledge of the Surgical Technologist using the procedural format. The anatomy, physiology, pathophysiology, case management, and patient considerations of Orthopedic Surgery, Ophthalmic Surgery, Plastic/Reconstructive Surgery, Cardiothoracic and Peripheral Vascular Surgery, and Neurosurgical Surgery will be presented. Outside preparation and study time, in addition to regular classroom activities, is required to complete the class assignments. The type of outside preparation may take the form of homework assignments, projects, reading, and required studying. Surgical Procedures Lab II – This course provides a laboratory environment in which students concentrate on further development of skills and practical performances by preparing for a variety of more complex surgical procedures in a non-patient contact environment. Emphasis will be placed on learning and understanding the different roles in the operating room and how to build teamwork by providing mock situations in which students will have the opportunity to assume sterile and non- sterile member roles, as well as an understanding of safety concepts, including instrument, sponge, and needle counts, as well as patient identification. During this course, students are given the opportunity to discuss, understand and demonstrate group dynamics, cultural diversity, leadership, and teamwork. Sterile Processing – This course focuses on completion of a rotation in the Sterile Processing Department of a health care facility where the student will participate in the instrument reprocessing experience including sterilization, disinfection, tray assembly, sterile storage, and distribution. Clinical Externship I – This course focuses on application of professional knowledge, skills, and behaviors in a patient care setting at a local health care facility. The student will actively participate in basic to moderately complex surgical procedures in the assistant circulator, observation, second scrub, and first scrub roles. Outside preparation and study time, in addition to regular classroom activities, is required to complete the class assignments. The type of outside preparation may take the form of homework assignments, projects, reading, and required studying. Clinical Externship II – This course focuses on application of professional knowledge, skills, and behaviors in a patient care setting at a local health care facility. The student will actively participate in moderately complex to complex surgical procedures in the assistant circulator, observation, second scrub, and first scrub roles. Outside preparation and study time, in addition to regular classroom activities, is required to complete the class assignments. The type of outside preparation may take the form of homework assignments, projects, reading, and required studying. outside preparation may take the form of homework assignments, projects, reading, and required studying.